The versatility of this pico de gallo salsa is limitless! Put it on grilled chicken or steak, add it to eggs, or serve with tortilla chips. 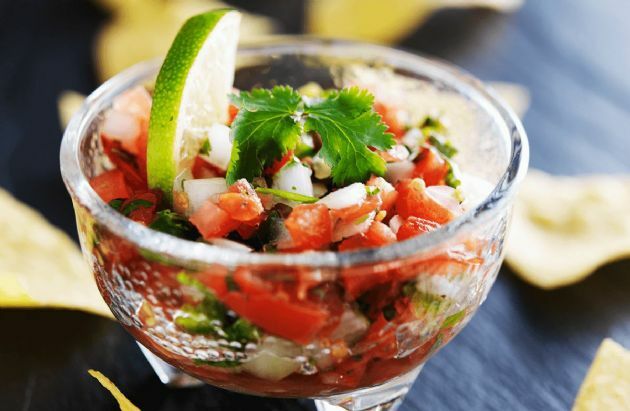 The versatility of this pico de gallo salsa is limitless! Put it on grilled chicken or steak, add it to eggs, or serve with tortilla chips. * you can roast your tomatoes for great flavor. heat up a frying pan or skillet on medium high heat. Place whole tomatoes in the cookware and toast the outside of it until the skin begins to break and split apart. remove from heat and continue with step two. note if you prefer smooth salsa as opposed to chunky just put all this good stuff in the blender. This is absolutely fantastic!! I made for a football snack yesterday. My husband & middle son were hooked immediately! I will make this again! A favorite in our house! I use lime instead of lemon and prefer when I have red onion over yellow or sweet. I will have to try roasting the tomatoes next time, and maybe the jalapeno, too! I've been looking for something new with my chicken. I also added the Fiesta Lime Mrs. Dash spice to this....yummy!!! Gave it just a lil more bite, as hubby doesn't care for jalapeno's....I also used that spice on my stir fry vege's. just found TOMATILLO's at the farmers market (was not sure what they were...they suggested for salsa, etc.) and have started adding them to my recipe...GREAT ADDITION! using jalapeno doesn't necessarily make it hot. just make sure you have no seeds. The seeds is what makes it hot.